Thanks for joining us today. 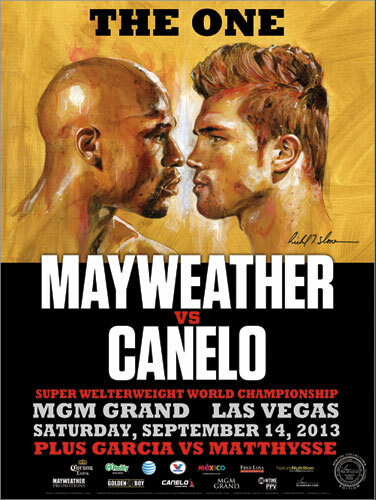 Now that Labor Day has passed, I think there’s only one thing on everybody’s mind and that is “THE ONE: Floyd Mayweather vs. Canelo Alvarez,” taking place Saturday, September 14at the MGM Grand Garden Arena in Las Vegas, live on SHOWTIME PPV. Today, we’re hosting a conference call with Canelo Alvarez himself and to make that introduction, I’m going to go ahead and turn it over to Oscar De La Hoya, President of Golden Boy Promotions. Of course that’s why I’m very motivated; of course I could. It would be a great win. If I win this-onSeptember 14th when I win it it’s going to be a great win so of course it can change history. Hello. Oscar, as a promoter-well, everybody is looking forward to a great fight of course, first of all,September 14th-as a promoter do you see the possibility of boxing’s next great trilogy taking shape? If Canelo wins and there’s a rematch, then there could be another rematch, do you see that happening? Less than 24 hours after going on sale on June 25, the event was sold out, but six MGM Resorts properties will host live closed circuit telecasts of “THE ONE.” Properties showcasing the event include ARIA, MGM Grand, Mandalay Bay, The Mirage, Monte Carlo and New York-New York. General admission tickets for the closed circuit telecasts are priced at $100, not including handling fees, and are available for purchase at each individual property’s box office outlets and also are available for purchase by phone with a major credit card at 866-799-7711. Closed circuit ticket sales are limited to eight (8) per person. Tickets also are available through Ticketmaster by calling (800) 745-3000 or online at www.ticketmaster.com. “THE ONE” will also be broadcast on nearly 550 select movie theaters across the country. Tickets are available at participating theater box offices and online at www.FathomEvents.com. 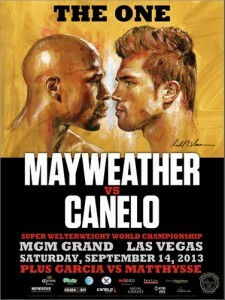 For more information, visit www.theonefight.com, www.floydmayweather.com,www.mayweatherpromotions.com, www.goldenboypromotions.com,www.sports.sho.com andwww.mgmgrand.com, follow on Twitter at @FloydMayweather, , @CaneloOficial, @DannySwift, @IsheSugarShay, @Canochampion, @AshleyTheophane, @MayweatherPromo, @DannySwift, @IsheSugarShay, @GoldenBoyBoxing, @mgmgrand and @SHOSports, follow the conversation using #TheOne and become a fan on Facebook at www.facebook.com/FloydMayweather, www.facebook.com/MayweatherPromotions, www.facebook.com/GoldenBoyBoxing and www.facebook.com/SHOBoxing.